It is a common belief that Blackjack was first played in France. The earliest record of this game is as "Vingt-et-Un"(which means 21 in French) and is of the 17th century. Just like other popular games, there is no clear data about how and where Blackjack originated, but, there are a huge variety of theories regarding this matter. But still, some gaming experts have arrived at the conclusion that Blackjack is a member of a group of games that comprises of Baccarat, Seven-And-A-Half and Vingt-et-Un. Vingt-et-Un is known as 21 in North America and as Pontoon in Australia. You must have heard the names of some of these games and are probably wondering how they are similar to each other. Well, all of these games have been given the credit for being the inspiration behind Blackjack. But, exactly how any of these games led to Blackjack is not clear. Following the French revolution in 1789, Blackjack was introduced to America and it instantly took the entire USA by storm. It gained immense popularity due to the flexible and independent nature of the game. People who gambled professionally didn't take much time to realize that this game was amazing and the bets and odds could be manipulated. At that period of time, there were no regulative laws related to gambling. This allowed Blackjack to grow into a huge phenomenon. In the 19th century, the government realized that regulation and control was necessary in the world of gambling in order to avoid corruption and crimes. Rules were introduced to make sure that gambling did not promote corruption and did not provide a base for planned crimes. After the problems related to regulation, Las Vegas revamped itself; and, Blackjack became even more popular. All other states were apprehensive about reinitiating gambling in casinos, making Las Vegas the gambling heaven of the USA. Blackjack turned into the most popular casino game. However, when it was first brought to America, Blackjack wasn't appreciated. In order to change this the casinos started giving bonus winning options in order to promote the game; for example, a player would win a 10 to 1 payout if he had the Ace of Spades and either the Jack of spades or the Jack of clubs. 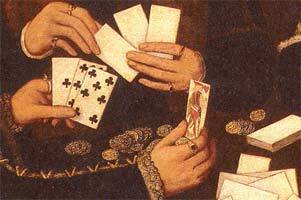 Thus, naturally, the hand that won was called the Blackjack. This name was accepted widely even though the promotional pay outs were stopped quite soon. Thus, in 1919, special tables that were green felted were being developed for Blackjack. In 1931, this game ranked 3rd in terms of popularity in the Nevada casinos, after Roulette and Crabs. In 1948, Blackjack got promoted to the 2nd position and finally, in 1958, thanks to the introduction of arithmetical strategies to win this game, Blackjack reached the number 1 position.